The June L. Mazer Archives is the largest major archive on the West Coast dedicated to preserving and promoting lesbian and feminist history and culture. By creating a safe place for women to explore the richness of lesbian history, perhaps adding to it themselves, we are paving the way for future generations to understand more fully their own identity and history and help maintain this vital link to their own past. June L. Mazer (left) seen here with Bunny Mac Culloch, was born in Baltimore, Maryland in1929. Her educational experiences combined with her tenure at the Children’s Experimental Theatre in Baltimore, the Center for the Healing Arts in Los Angeles, and the California Institute of Psychodrama in Los Angeles led her to the practice of Psychodrama Therapy at several different medical institutions throughout the country. 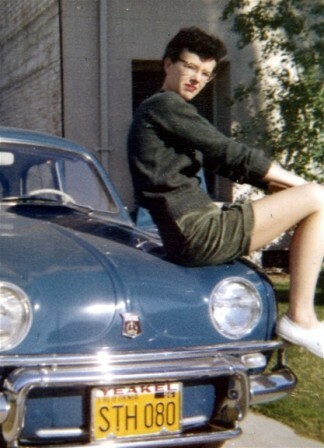 In 1970, she moved to Los Angeles and soon became active in the lesbian activist community. 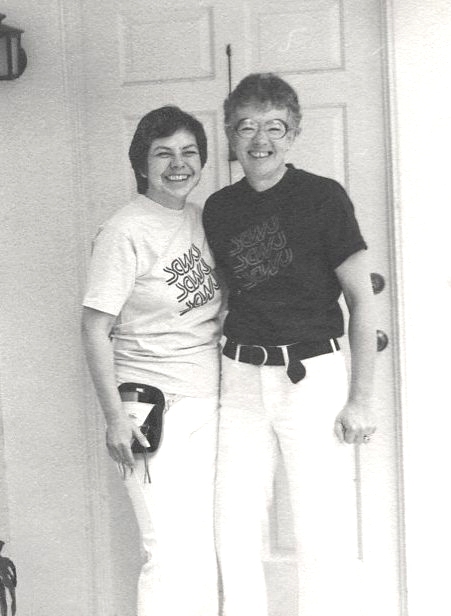 After her death in1987, the name of the West Coast Lesbian Collections was changed to the June L. Mazer Archives to commemorate her commitment to lesbian activism and historical preservation. The June L. Mazer papers include her personal writings, ephemera, as well as her publications and clippings. June L. Mazer was a member of SCWU (Southern California Women for Understanding) where she met her partner Bunny Mac Culloch. Together they worked on the SCWU Newsletter and were both very involved in the organization for the rest of their lives. June wrote many journals, one of note is after getting cancer for the second time she writes about how “lucky” she feels because she has so much support (from her friends in SCWU ) compared to her gay male friends who contracted AIDS. June died of cancer in 1987. Bunny Mac Culloch was born Nancy Winifred Mac Culloch in Salem, Massachusetts in 1928. She majored in journalism at Vermont Junior College in Montpelier for two years before traveling throughout Europe. She was a lifelong activist and community partner, serving as an active participant and board member of several organizations including the SCWU, (where she met June Mazer), Connexxus, and the West Coast Lesbian Collections. She was a life long lesbian and known for being dedicated to the Mazer Archives. She and her partner June held the the Archives in their home in Altadena from1986-1989. Bunny was willing to go to any lesbian’s home and clear out their closet (literally) in order to keep from losing lesbian history. She advertised this service to lesbians all over Southern California in the 80’s on IMRU Radio, the long time Gay & Lesbian Radio station on KPFK . Bunny had recruited many volunteers who she called Elves. It has been said that she appreciated the “elves” very much and she guided them into taking over the Archives after she was gone. This included making a recording in her last days about her wishes for the future of the Archives. In 1989 the Archive was moved from Altadena into the Werle Building in West Hollywood with the help of Jodi Curlee, Lauren Jardine and Del Martinez of Connexxus/Centro de Mujeres, Jean Conger and the Gay andLesbian Task Force. Later that same year, Bunny died of cancer. She was also an accomplished film editor and avid film collector. The Mazer Lesbian Archives has been run by volunteers for most of its years and has also been supported by individual donors, grants, and the donation of our space by the City of West Hollywood. The Archives have also created an outreach and collection-building partnership with the University of California Los Angeles (UCLA) Libraries. The lesbian world that I first came into, here in Los Angeles almost forty years ago, seemed to me to exist only in darkness. Our world seemed to have been invented in that moment of time. We had no past — or, if we did, no one knew or could tell me about it. Because we had no knowledge of those who came before us, our isolation and loneliness felt tragic and inevitable. It is no wonder that the few books that were written had sad titles such as We Walk Alone or Odd Girl Out. Twenty years later, in the 1970s, the lesbian world began to change. We realized, as we dreamt of the Lesbian Nation, that we could and must make our lesbian communities strong. Part of our struggle was to fight the erasure that had always been used to keep us weak. We had to proclaim not only our immediate presence but the fact that many went before us, that we did indeed have a history. It was in this climate that The June L. Mazer Lesbian Archives was created. The Archives, originally called the West Coast Lesbian Collections, was founded in Oakland California, in1981. Six years later it was moved to Los Angeles by Connexxus Women’s Center/Centro de Mujeres. The Archives acquired its present name after the death of June Mazer, in honor of her work as a community activist and invaluable supporter of the Archives. The June L. Mazer Lesbian Archives remains the only archive on this side of the continent that is dedicated exclusively to preserving lesbian history and to guaranteeing that those who come after us will not have to believe that they “walk alone.” The Archives is committed to gathering and preserving materials by and about lesbians and feminists of all classes, ethnicities, races and experiences. Included are personal letters and scrapbooks, artwork, manuscripts, books, records, newspapers, magazines, photographs, videotapes, flyers, papers of lesbian and feminist organizations, private papers, and even clothing, such as softball uniforms from the 1940s and 50s. Hundreds of lesbians and feminists have been inspired to donate artifacts of their personal and collective histories. The Archives encourages all lesbians to deposit the everyday mementos of your lives so that others can discover them in the future. The privacy of any donor is protected to whatever extent she desires. In 1989, the archives earned 501(c)(3) nonprofit status and received donated space from the City of West Hollywood, where it remains today. 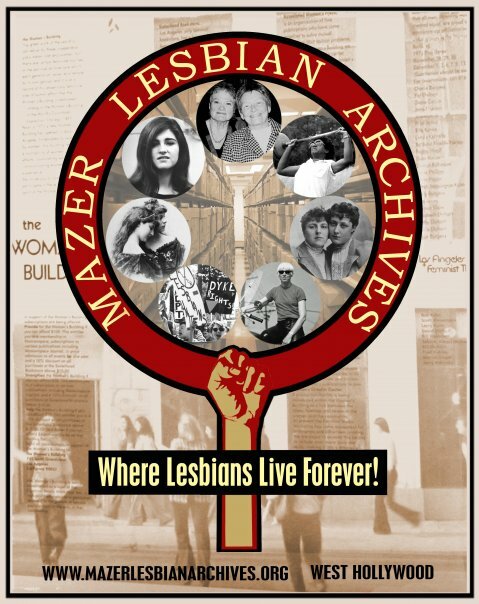 The all-volunteer staff of the Mazer Archives not only keeps the doors open, but also helps to make lesbian communities and others aware of our history through speaking engagements, the Archives’ newsletter, In The Life, (no longer in publication), and special programs and exhibits.